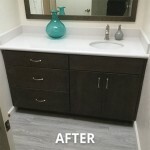 Homeowners working on Bathroom Remodeling Phoenix want a bright, unique, contemporary design with a walk through shower and lots of natural light. Open, light and sophisticated master bathroom. 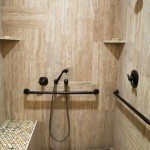 Beautiful rain showerhead makes for a spa-like experience. 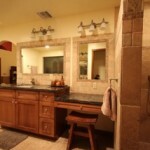 Contemporary Bathroom Remodeling is a great way to improve your quality of life. Bathrooms are the place where we start each day and the place where we seek refuge at the end of our day. Wouldn’t it be nice to come home and enjoy a relaxing and rejuvenating bath in your new spa-like retreat at the end of a long day, or after a grueling workout session?